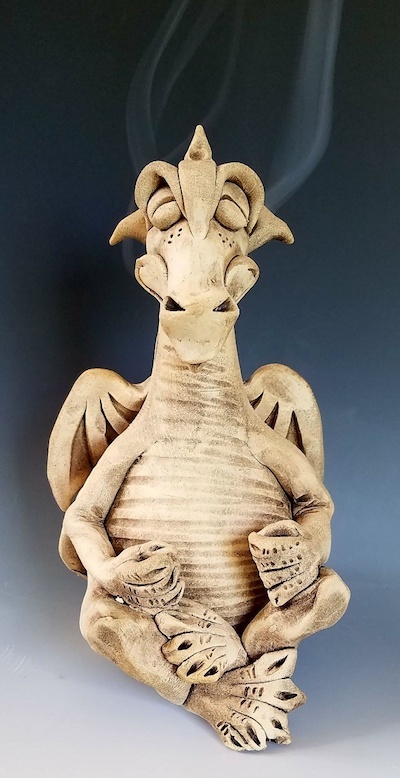 This 8" tall hatchling dragon blows smoke out of his nostrils. Put lit cone in opening in back of shell. Available in blue, green, or purple. A pack of incense cones is included. 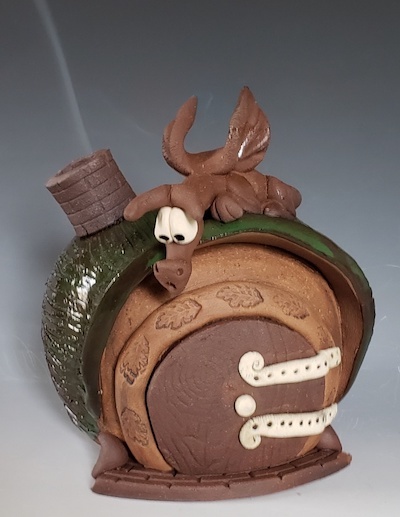 This unique incense burner hangs on the wall. He is about 8" wide and 7" tall. He always has three fangs and horns. He comes in the natural clay with porcelain details and staining. Feed the lit incense cone into an opening in his jaw. A pack of incense cones is included. This cute 5" tall dragon has a stopped up nostril, which he is trying to remedy. Put an incense cone into the opening in his back, and the open nostril smokes. Available in green, purple, black, blue glaze (shown) or stained. A pack of incense cones is included. This cute 6" tall dragon loves his cappuccino so much that smoke comes out of his ears (and the cup). Just put a lit incense cone into the opening in his back. Shown in the green glaze. Also available in blue, purple, or black glaze, or in the natural stained finish. A pack of incense cones is included. Big Trouble a 7" tall cranky dragon that smokes from his nostrils! He comes in black only. Just light an incense cone and slip it into the opening in his back. A pack of incense cones is included. Dufus is an ornery 6" tall dragon, sticking out his tongue and smoking from his ears. Slide a lit incense cone into the opening in his back. He is available in stained (shown), green, blue, black or purple. A pack of incense cones is included. Toastee is an unusual flying and smoking dragon. He is 7" wide, 11" tall, and sticks out 5" from the wall. The lit incense cone goes into an opening in his side. Toastee only comes in the stained natural clay with porcelain details. A pack of incense cones is included. This 10" tall wizard has a pet owl on his shoulder. Place a lit incense cone in the opening in his back, smokes from mouth & pipe. Available in dark clay with staining only. A pack of incense cones is included. 6" tall Hobbit House is being closely watched by a Smaugling on the roof. It smokes from the chimney by inserting a lit incense cone into the side opening. Mainly natural clays with staining and green glazed grass on the roof. A pack of incense cones is included. This peaceful 8" tall dragon in lotus position smokes from its ears. Just put a lit incense cone in the opening in its back. Available in natural clay only. A pack of incense cones is included.